The Bélaműhely Sound Art has been building sound producing devices and playing them since 2007. We have experimented with developing musical games and we research people’s attitude towards music, sounds and creating them. We produce our devices together with Tóbiás Terebessy and Medence Group from industrial waste, used personal belongings, barrels, pipes, bike and computer equipment, tubs, pans and paper boxes. We have developed some really unique musical equipment, instruments and musical games in t he last few years. When developing a new instrument, we do not try to make it sound perfect as there are the already existing instruments for that. We try to make virtue from the overtones and imperfect sounds, we want to create a new, even for us surprising world of sounds. 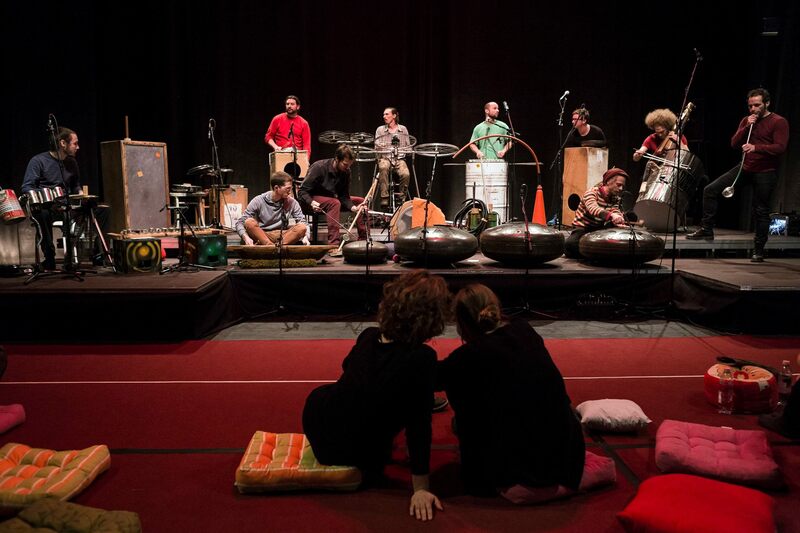 In addition to concerts and theatre work, we organise workshops for children and adults. We do musical practices and games, talk about how sounds are born, their types and our relation with sounds and silence. Apart from Hungary we have already been to several European countries with our performances, concerts and workshop programs. The visitors of the instrument making workshops can learn how to create and use sound producing devices and how to combine them. We often use improvisational, ironic and self-ironic techniques and basics with electronic effect (big beat, dub step, drum and bass, jungle), but authentic Turkish, Arabic and South American rhythms can also be found in our musical material. We play Gypsy, Jewish songs and music from Vojvodina and Ghimes as well as classical and contemporary literature pieces. We create sound producing devices, play drums, bow, plunk, blow. We knead our experiences together and look at how things work when we do not have a detailed plan and do not project for good. We observe the thing called coincidence that comes from us and the surrounding world. Coincidence is when we do not presume, we do not think. The existence happening by itself from unconscious time, body and object. The presence of the self-identical eternal. If we let it be born by simple curiosity and calmness, we serve it and make it serve us then it will work and guide us to unknown territories. It gives solutions surprises us and is a creative partner in our carefree games. The backbone of our performances and sound producing devices is that we use the playfulness coming from the unconscious and coincidence consciously. A good improvisation is also a chain of coincidences which rides the present moment and also carries the desires of tomorrow and the memories of yesterday within. Guiding back to playing, to involuntary child’s actions, to the pleasure of playing music on and with everything, to the ecstasy of creating organically flowing sounds what we can even forget and be ashamed of by the time we grow up. Our aim is to lead the people back to the natural and originally existing inner skill of creating sounds and producing instruments while freeing us, concentrating our minds, strengthening self-identity and communal existence. We try to improve our fellow people’s quality of life by showing a way of calm, sympathetic and loving existence for everybody.